Yesterday, Sunday 13th October, Palestinian farmers and international activists were picking olives in Qaryut when it was observed that two members of settler security from the illegal settlements of Eli and Shilo were nearby. The settler security then attempted to intimidate the olive farmers, before soldiers arrived and forced both the Palestinians and internationals from the land with a supposed military order. At around 9am yesterday, two armed members of nearby settler security approached the Palestinian land and stood on a hill overlooking the farmers, shortly afterwards a military vehicle arrived. Fifteen minutes later six soldiers approached the property of the farmer and declared the place Area C and a closed military zone. The farmers and international activists were informed they had to leave. The farmer and the internationals were given 30 minutes to remove themselves from the area, and were threatened with force. They also confiscated the ID of a Palestinian man who came to mediate and wouldn’t return it for 90 minutes. The farmer and internationals then moved to another area as the soldiers had said, the day before, it would be safe for harvesting. Suddenly that area had also become a closed military zone. When the commander was asked for some justification for this order, he showed a map printed on paper without any official stamp or signature and refused to allow any photographs of the map to be taken. 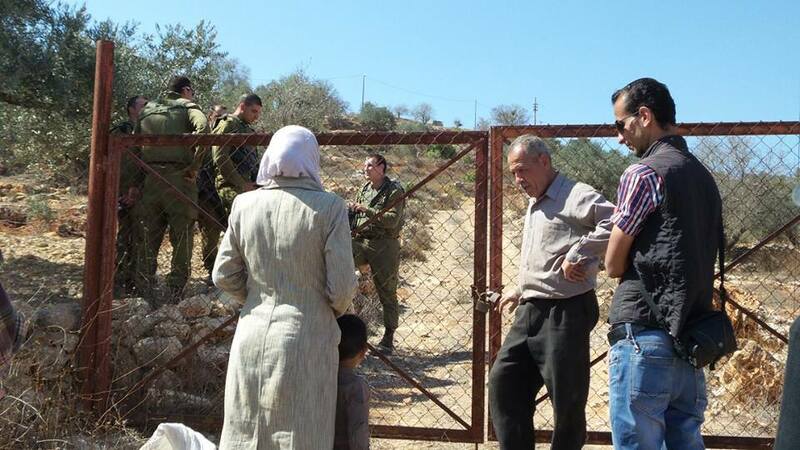 This behaviour from the Israeli army was not unsurprising as on Saturday 12th October, also in Qaryut, Israeli soldiers forced the same farmer from his land after nearby settlement security arrived.